The map, a model of abstraction and a guide for orientation is to be extended along an subjective asymptote. Orientated on scientific methods of representation,a unique cartography between ego and geo, between the interior and the exterior, between micro and macro is in a constant stage of development. 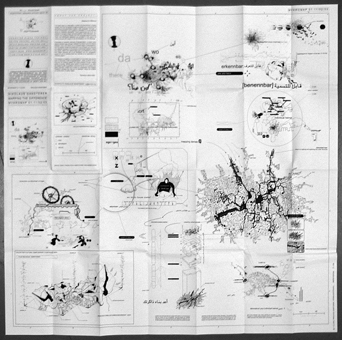 During a residency in Damascus (organized by Christian Reder and Simonetta Ferfoglia) I developed a unique cartography. 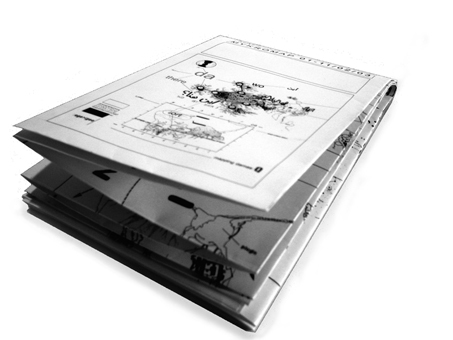 The basic idea is a "Meta.Atlas"consisting of a dense web of maps (See drawings: The DamasQ drawings), in which the phenomenon of being foreign and thus connected thought-processes are to be examined according to the parameters location, area, language. The direction of reading is constructed in a non-linear way and follows a rhizomatic mode of representation. Interviews, narratives and quotations hereby form the language-based structure. Video and photographic elements are providers in the search for motifs and act as a basis for the re-translation into the drawings. The feedback between the map and its spectator makes the subjective construction of reality visible. 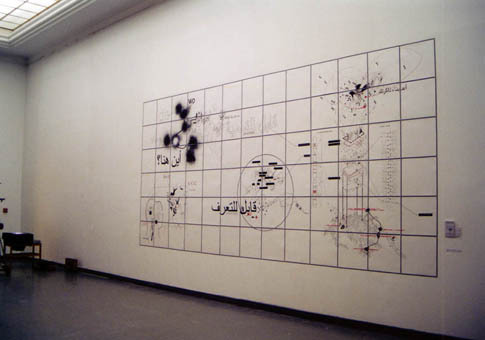 – 2003: "Mapping II", Mess Hall, Chicago, USA. – 'Transfer Damaskus. Urban Orient-ations', Christian Reder & Simonetta Ferfoglia (Eds), Edition "Transfer", Springer Wien / New York, 2003. – “Künstlerische Stadtforschung”, Doris Krumpl, in: der Standard, 07+08. 03.2003. – "Urban Orient-ation", Christoph Winder, in: Wespennest, No 135 / 2004, Vienna, Austria. – "Transfer Damskus"-Volksstimme, No. 12, 20.03.2003, Vienna, Austria. – Falter, Wien, No. 11/2003, Vienna, Austria. – Zenith, No 3/2003, Hamburg, Germany. – Andreas Spiegl, in: Springerin, No 2, June 2003, Vienna, Austria. – Die Zeit, No 35 / 21.08.2003, Hamburg, Germany. – Architektur Aktuell, 6/2003, Vienna, Austria. – “Diese Energie entfalten wir wohl nur in der Fremde", Christian Reder im Gespräch mit Claus Philipp, Der Standard, 12.04.2003, Vienna, Austria. – Krone, 11.03.2003, Vienna , Austria.